LE Vintage Ginny Repro "Binky"
Catalog > LE Vintage Ginny Repro "Binky"
Adorable Limited Edition Vogue Ginny vintage reproduction "Binky." She was made in 2003 and is #3SL001. She's dressed in a yellow knit skirt, with matching yellow cap, a pastel striped top with matching striped socks, yellow cotton undies and white center-snap shoes. 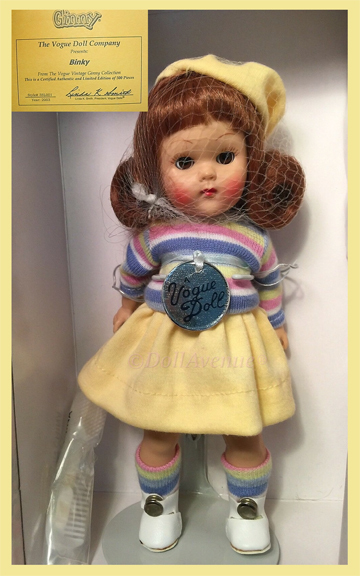 This adorable doll is a Limited Edition of only 500 made and never been removed from the box. She comes in her original classic pink Ginny box, with tag, COE, and comb/brush.